There’s the Ganga, the fishermen who catch no fish and the dolphins that cannot be found in India’s only dolphin sanctuary. At first glance, the Ganga in eastern Bihar bears some resemblance to a beautiful, sacred river. Few places are as beautiful as the Vikramshila Gangetic Dolphin Sanctuary. 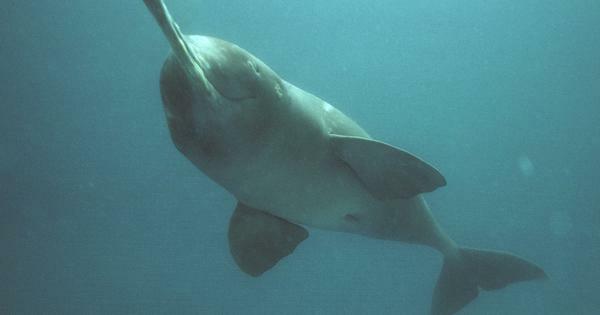 This is the only sanctuary legally designated for India’s national aquatic animal, the blind, side-swimming, most ancient of all cetaceans: the endangered Gangetic river dolphin, Platanista gangetica gangetica. Stretching over 67 km of the river, the sanctuary lies between Sultanganj and Kahalgaon. With me are researchers Nachiket Kelkar of the Ashoka Trust for Research on Ecology and the Environment and Subhasis Dey of Vikramshila Biodiversity Research and Education Centre, who have been working in this area on the ecology of river dolphins and fisheries for over a decade. As we coast along the river, a row of toddy palms comes into view on the distant south bank. A couple of decades ago, the river lapped at those palms; today the waterline is about half a kilometre away. It is the first visual marker we get of the extent to which flows in the Ganga have been steadily reducing; this summer, before the monsoon rains, it is at an all-time low, the depth sensor tells us. Tear-shaped diaras (silt islands) dotted with clumps of sedge and grass and local vegetation rise about a foot or two from the water. These islands that emerge from the river, only to be reclaimed by her, are full of life. Two bright-beaked skimmers perch on one edge; lesser whistling teals brown an opposite edge; open-billed storks forage in the shallows; a row of hard-shelled tent turtles basking in the sun plop back into the river in sudden alarm at the put-put of our boat. Walls of silt rise up from the green waters on both sides of the river, pocked, like ancient computer punch-cards, with bank-mynah homes. The birds flit in an out, dipping and rising in a murmur. A grave greater adjutant stork wades past us, its wizened face wary as it examines us. Two more display their massive black and white wingspans further out on the diara, and a fourth makes an awkward landing. This region of eastern Bihar has been a breeding site for the endangered species (only the third area in the world where they breed), and there is reportedly a stable population of 300 individuals. All along the Ganga-Brahmaputra-Meghna basin, diaras are claimed and ‘owned’, farmed and patrolled. The silt is as fertile as it gets, and the claim across the basin is that vegetables grown on these silt-islands are the tastiest in the world. Silt transforms floodplains into food bowls. Silt makes deltas. Silt is the silent, unassuming hero of South Asia. And the Ganga is probably the siltiest river in the whole world, even more than the Amazon. Tumbling down from the Gangotri glacier some 1,500 km to the north-west, in Uttarakhand’s Himalayas, the Ganga begins its descent as Bhagirathi. Mixing Alakananda into itself at the multihued confluence of Devaprayag, the river cleaves the Himalayan mountains, picking up massive amounts of silt along the way, and hurtles down towards the plains. Its white waters roil past Rishikesh, placate at Haridwar, and flow down towards the floodplains of Uttar Pradesh. The holy river turns putrid at Kanpur, and her water is so severely extracted that she is little but sand when she flows into Allahabad. Here, the waters of Chambal remake her flows via the Yamuna. Defying all scientific odds, her dark waters purify a million sins at Varanasi while taking into herself more foul foam and faecal matter, chemicals and cadavers. Then she flows into Bihar. After suffering the conurbations and confusions of modern civilisation, the river is renewed. The Ghagra, Gandak and Koshi rivers, coming down from Nepal, infuse the Ganga with fresh life. In Bihar it is the sum of its tributaries. The Ganga meanders now with fresh waters, and braids its way through the floodplains for another thousand kilometres, down to West Bengal and Bangladesh and then to the Bay of Bengal. We are in the lower floodplains of the Ganga. Its swatch here is arced with ox-bows and punctuated with comma-shaped diaras – silt islands that are neither completely land nor water. Soon, the river will drink from the clouds, its flow will be largely fluvial, and it will try its best to erase memories of the abominations upstream. From the lower observation deck of this dolphin survey boat, three pairs of eyes – two experienced, one novice – seek signs of the trademark arc of soft grey, of a beak-like snout cleaving the surface to breathe, of the gentle curve of the dorsal fin diving back in: the Gangetic dolphin. We had spotted one when we had pushed away from the shore, but have seen none since. This, my researcher friends point out, is unusual – in this pre-monsoon season, 70-100 dolphin sightings is par for this short course. We go past the four kilometre-long Vikramshila bridge at Bhagalpur, and past the open air crematorium. The Bhagalpur Engineering College hostel is in sight – the marker for the outer limit of safe passage along the river. Beyond is a stretch where men on horses roam the diaras with guns and black flags in hand, waylaying boats, looting, and occasionally even killing those who refuse to comply with their demands. We turn around and return to Sultanganj ghat, traversing a stretch where 15-20 individual dolphins have hung around for years. Now, they are nowhere to be seen. Where was India’s national aquatic animal? Why was it not in the sanctuary? Speculations abound in the team. Had they been hunted? Had they moved downstream? Had the dredging that is being done by the government in preparation for the National Waterways project disturbed them? Had they died of other causes? There were no answers yet, only alarm and much concern. And where have all the fish gone? On paper, the VGDS is a protected stretch of river, but in a heavily human-dominated landscape. The people all along the route, from Sultanganj to the eastern limit of the sanctuary at Kahalgaon, use the river for various purposes. There are around 3,000 fishing families in the area that depend directly on the river, as they have for generations. Every morning of our time there, we headed to the market to see what fish had come in. That would be an indicator of the fish biodiversity in the river. The Kahalgaon fish market is shaped like a sleeping "m", lined with open 8ft x 10ft stalls, coloured in purples, sunshine yellows, pistachio greens, fuchsias and electric blues. In the doorway of each stall hangs a huge scale, the weights towering heavy beside it on the scratched, chipped, concrete floor. An ice crusher stands at the hump end of the ‘m’ and shudders into use every hour or so, its rhythmic crushing drowning our voices. It is seven on a late May morning, and we are at Chandan’s purple-painted stall. We perch ourselves on hastily gathered rickety plastic chairs and wait for the market to come alive. The catch should have come in by this time, Chandan says. Maybe the squall of the previous night, where silt flew in from the diaras like white arrows, meant a bad night for the fishers, and they’d be late. We’d have to wait and see. Chandan has never taken to the river to fish, but his father Dasharath, now pushing 70, is a veteran fisherman and well-respected village elder. “We’ve been here about 200 years, this is our hometown. Back then, my family would ferry cargo in much bigger boats. While we fished, we were not dependent only on fishing,” the old man tells us. But fish was plentiful, he recalls. Bachwa (Clupisoma garua) would sell for a rupee or Rs 1.50 a kilo in the late 1960s. “We would fish one quintal from just putting out our nets from 8 am to noon. Ice would come from Bhagalpur, and the fish would go by train to Nabadwip and Chunchura [in West Bengal]. One year, there was so much hilsa, so much hilsa!” His face breaks into a toothy smile at the memory. “It sold for just one rupee for a kilo, and still no one to buy! This was when I was a young boy.” These days, hilsa caught in Indian waters sells for around Rs 1,000 a kilo, the price for choice cuts rising as high as Rs 1,500-Rs 2,000 in the festival season. The river’s stock of fish has depleted in both biodiversity and abundance, Dasharath says. Stocks have plunged 70%-90% in the last 30 years. What we saw that day at the Kahalgaon fish market was no aberration – the story repeated itself the next day, and the next, and the next. The massive weighing scales stayed dormant, unneeded. For want of anything to do, two little fisher boys convert one stall into a recreation room and start up a game of carom. The other stalls, including Chandan’s, waited for fish that never came. An eerie quiet envelops fish markets all along the Ganga. “Ever since the Farakka barrage was built, hilsa, jhinga (prawns), pangas, bachwa, seelan, and other migratory fish are completely finished. They’ve disappeared from our tables and we don’t ever see them anymore.” Every fisherman, bar none, said this to us — in Kahalgaon, in Barari, in Naugachhiya, in Koskipur – on both banks of the Ganga, past the confluence of the Koshi. Hilsa (Tenualosa ilisha), the queen of fish, the prized meal in any Bengali household, used once to swim up the Ganga, against the monsoon freshet, all the way to Allahabad and further to spawn. The young ones would then return to the sea, and repeat the spawning cycle come the next monsoon. When India built the barrage at Farakka in West Bengal, this changed. All anadromous, catadromous and potadromous fish stocks — hilsa, tiger shrimps and such, plunged to near zero upstream of the barrage. This was the beginning of the collapse of fisheries in the Ganga. Fishermen are quick to identify Farakka as the root of all their ills. But the barrage does not explain the disappearance of non-migratory species. The blame for that lies elsewhere. In 1991, the Ganga Mukti Andolan led the effort to free the Ganga from the "panidars" – the feudal water lords who are the river-equivalent of zamindars (landlords). They laid claim to stretches of the river and “owned” everything in that stretch, including the fishing and even the use of the river. Fishers were free to choose whether to work or not. But if they worked, and refused to pay 50% of the fish catch (which was the norm), they were threatened. The abolition of the feudal water-lords was much needed, but the freeing of the Ganga from oppressive contracts became a double-edged sword. Now, anyone could fish anywhere. While that seemed a win at first blush, it has proved disastrous for both traditional fishermen and the river ecology. There is a simple way to tell the ‘traditional’ fishermen from the free riders. Those who know how to weave a net by hand, from thread are the real deal. If fishing in the Ganga were restricted to hand-made nets, the fishermen believe, the river would be fecund still. While reality may be a little more complicated, this nevertheless serves as a good starting point. The “free for all” resulted in non-fishermen also taking to fishing, swelling the number of fishers on this region of the Ganga. The fishermen of Kagzi Tola are agitated; they speak over each other as they rush to explain the destruction of their river as they see it. The problem with the mosquito net in common use, the fishermen explain, is that it catches everything – gravid fish, baby fish, yearlings, the lot. These baby fish – the next generation of riverine stock – die in the nets, and are tossed back into the river since there is no market for such small catch. Thus, entire generations of fish are killed daily, rapidly eroding the river’s stock beyond the possibility of replenishment. For the part-timers, fishing is not their primary business. They depend on their fields, where they grow vegetables. Thus, sustainable fishing practices are not top-of-mind for them, intent as they are on making a quick buck where they can. The traditional fishermen however have no land, no alternate means of livelihood. They have depended upon the river for almost 100% of their sustenance. “If we don’t allow the eggs to hatch, if we don’t allow the fingerlings to grow, how can we expect to eat tomorrow?” This is a refrain we hear throughout among the traditional fishing communities all over the Ganga-Brahmaputra- Meghna basin. The jump from frying pan to fire is complete with the rise of the river pirate along the “free” Ganga of Bihar. The oppression of the panidars has now been replaced by the predatory raids of armed dacoits. Marauding the diaras, these gangs on horseback regularly target fisherfolk. “They waylay us with our fish and force us to cook, and they take our fish away. If we don’t comply, they could kill us,” says Dasharath. There are several such predatory gangs, all rivals, all armed, dangerous, and trigger-happy. The dolphin survey team has been caught in crossfire twice, an unwitting bystander in a gang war that never ends.